Trufan | Reward Your Fans. We can’t get everyone into our private beta but we can still get you a data report with your most engaged and influential followers on Twitter. 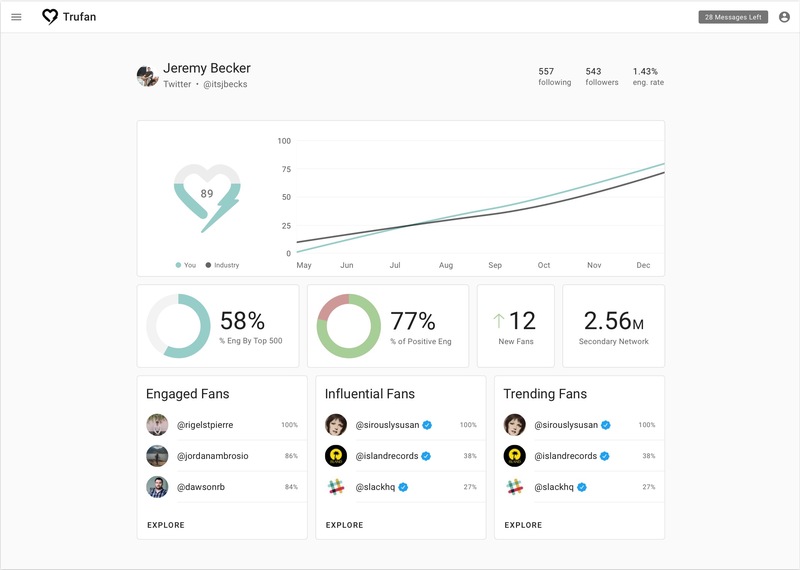 Trufan is an audience management platform that helps brands and influencers grow their social community, distribute viral content and sell directly to their top fans. Users can identify, activate, reward and retarget their engaged, influential and trending followers. Build rapport through scalable 1 to 1 interactions and increase visibility where it matters with powerful custom audience or competitor data. Using Trufan’s state-of-the-art fan identifying algorithms, we can tell who your top fans are on Twitter. Review interactions and filter fan discovery using interests, keywords, location and more. Engage and reward specific follower segments at scale. Utilize our seamless messaging feature to convert your fans into customers! Increase your brand equity and fan loyalty. Once you start using Trufan, your fans will take notice, incentivizing many of them to engage more heavily with you on social media to get onto your top fans list. Sell directly to your top fans. Whether you’re planning an event or promoting a product line, utilize our one-click commerce capability to easily move product. Use promo codes to track the success of any promotion, giveaway or campaign. Influencers/celebrities can reward their top fans. Brands can sell directly to their top customers. Political parties/charities can host local meetups. Marketing departments can use Trufan data for retargeting campaigns. Managers can make strategic decisions (touring, hiring). © 2019 Trufan Inc. All Rights Reserved.